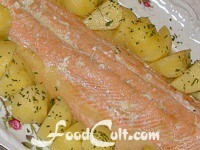 Meat, Poultry &amp; Fish - Free, Easy Recipes @ FoodCult.com - A Place for Galganov's Recipes and More - Food Matters! In our part of the world and our culture it was normal to treat meat, foul and fish as primary protien sources. We did, of course, have cheeses but dinner generally featured one of these three sources of protein with the major meal of the day, regardless of the time of day that big meal was served. Today almost anything goes. This fish is a tradional dinner component.